China may be the world's leading contributor to greenhouse gas emissions, but newly published findings show that much of the country's pollution is generated by the manufacture of goods for other nations, including the U.S. The irony: Pollution wafting overseas from China has a sizable impact on air quality along America's West Coast. Via NASA&apos;s Terra satellite comes a staggering view of China&apos;s pollution problem. 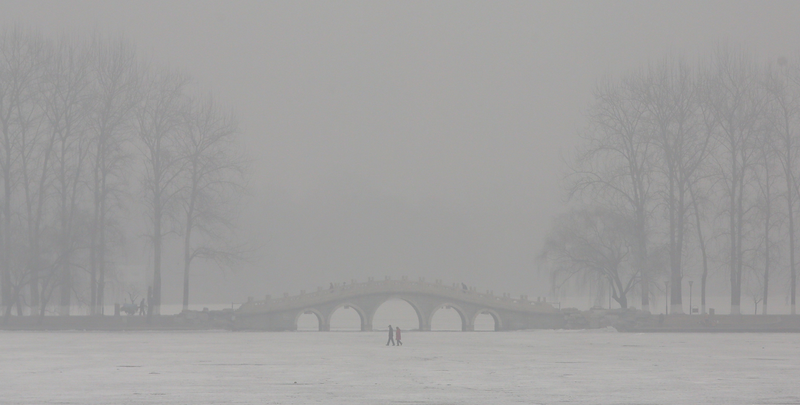 Top Photo of sever air pollution in Beijing by Feng Li/Getty Images. So just how much of China's smog is the U.S. responsible for? In this week's issue of the journal Proceedings of the National Academy of Sciences, an international team of climate modelers, emissions experts and economists led by Peking University's Jinai Lin conclude that in 2006 alone, between one-fifth and one-third of China's air pollution was associated with the production of goods for export. Of that portion, roughly a fifth was tied to the manufacture of U.S. goods. By those figures, America contributes to somewhere between four and six percent of China's pollution problem. Of course, the harsh reality about pollution is that it is never just one country's problem. Pollutants and the winds on which they're carried harbor no respect for international borders. "We've outsourced our manufacturing and much of our pollution, but some of it is blowing back across the Pacific to haunt us," said co-author Steve Davis, of University of California Irvine, in a statement. The researchers' findings indicate that, for West Coast cities like Los Angeles, that haunting has been to the tune at least one extra day of smog per year, due to nitrogen oxide and carbon monoxide generated by Chinese factories. On any given day, the researchers report, the sulphate generated from Chinese plants can account for as much as 24% of sulphate pollution over the western United States. If that's not karmic comeuppance, I don't know what is. The study serves as an compelling reminder that, in a global economy, you can outsource manufacturing – and, to some extent, pollution – but you can't outsource culpability. "This part of the analysis tells us that we should really be doing a consumer-based analysis to fully account for who's responsible for emissions," study co-author Donald Wuebbles, an atmospheric scientist at the University of Illinois at Urbana-Champaign, told National Geographic. "...it puts responsibility on those who are also consumers as well as those who produce emissions. That means we have to bear some fraction of the responsibility [for emissions produced in other countries]." The researchers' findings are presented in the latest issue of PNAS.